Wade Nygaard and the Auto Finance Super Center crew in RydellCars.com Victory Lane. Photo by Mike Spieker. GRAND FORKS, ND (July 31) - Although Wade Nygaard has led the Northern Outlaw Sprint Association points standings for the majority of the season, the Grand Forks, ND driver hadn't visited victory lane since May. 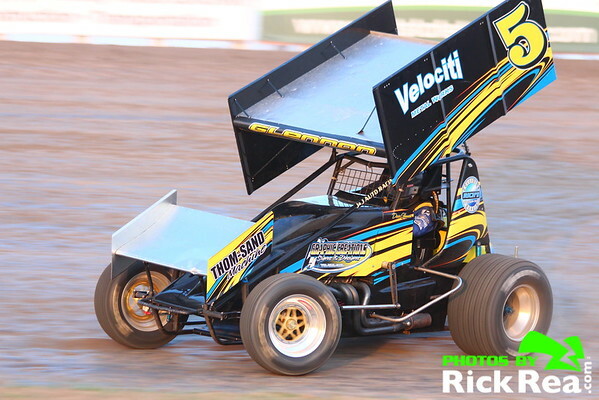 All that changed for the six-time NOSA champion Friday night at River Cities Speedway, however, as Nygaard drove from 11th to claim his 117th NOSA victory. The NOSA Sprint Car Series returns to River Cities Speedway for night #2 of 2015. GRAND FORKS, ND (May 7) - After a wild night of racing last Friday night at River Cities Speedway, the Northern Outlaw Sprint Association will be back in action tomorrow night to do it all over again.